Jimmy Olsen has Inspector Henderson and private eye Candy Myers investigate the mysterious Sidney while Superman trails the Fat Man to his country home. When Henderson and Myers fail to turn up any incriminating information regarding Sidney, Kent keeps his appointment with the Fat Man – unaware that his is walking into the Atom Man’s deadly trap! Clark Kent arrives at Perry White’s Florida retreat, unaware that the Atom Man and Sidney are plotting the destruction of Superman. Learning of Dr. Millison’s failed attempts to contact him, Clark flies back to Metropolis as Superman, and the famous scientist presents the Man of Steel with a kryptonite detector in the form of a belt. Germain chemist Josef Busch attempts to recharge the Atom Man’s deadly radioactive powers but is unable to find the missing catalyst for the formula. Believing that Clark Kent has suffered a nervous breakdown, Perry White forces is star reported to accompany him to Florida for a rest cure. Jimmy Olsen tells Perry White of the disappearance of the stranger’s body from the hospital while Dr. John Millison tries in vain to reach Clark Kent. Dazed and confused, Kent tells Perry and Jimmy that Henrey Miller is in reality Der Teufel’s Atom Man, but is not believed. Metropolis receives a reprieve from destruction when the Atom Man discovers that the kryptonite in his blood needs to be recharged after his battle with Superman. Recalling that the Scarlet Widow had three other fragments of kryptonite meteorite, Miller seeks the aid of the sinister Nazi agent known only as Sidney. Meanwhile, Superman lies unconscious in Linwood Hospital, not expected to live through the night. Rescued by hunters, Superman is brought by ambulance to Linwood Hospital. His only chance for life appears to be an emergency blood transfusion, but the sharpest medical scalpel can’t pierce his invulnerable skin. 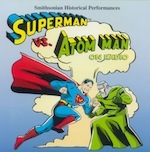 While the unconscious Man of Steel hovers between life and death, the Atom Man returns to Metropolis, intending to reduce the great city to dust. Accompanied by the local sheriff, Jimmy Olsen arrives at the scene of the battle between Superman and the Atom Man and identifies the corpse of Der Teufel. Buried inches beneath the sand, Superman’s body lies unnoticed until discovered by a hunting dog.